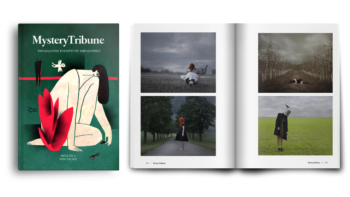 Summer 2017 digital edition of Mystery Tribune Magazine features a curated collection of the short stories, essays, book reviews and interviews by some of the best voices in mystery and suspense as well as exciting fine art photography. An elegantly crafted 180 page quarterly issue, and with a beautiful layout designed for optimal reading experience, our Summer 2017 issue will make a perfect companion or gift for avid mystery readers or fans of literary crime fiction. Stories by Aaron Fox-Lerner, Dan J. Fiore, Rob Hart, David James Keaton, and Teresa Sweeney. Essays by Reed Farrel Coleman, Shawn Corridan, and Elena Avanzas Álvarez. Interviews and Reviews by Staurt Neville and Richie Narvaez. Photography by Tommy Ingberg, Heather Byington and more.